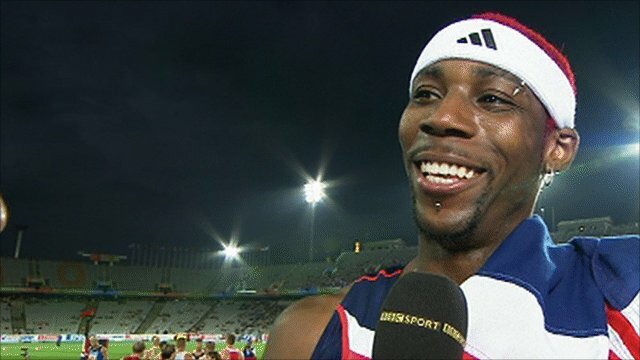 Triple jumper Phillips Idowu won Great Britain's second gold medal of the European Championships while Martyn Bernard took a high jump bronze. Idowu's fourth attempt of 17.81m was a new personal best and enough to see off Romania's Marian Oprea, who won silver, and beaten favourite Teddy Tamgho. 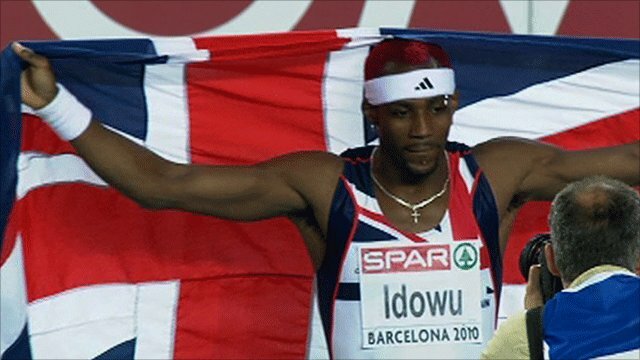 "I've always worked hard and by the grace of God I've come out a gold medallist," Idowu, 31, told BBC Sport. Bernard finished behind Russian duo Aleksander Shustov and Ivan Ukhov. Idowu, who adds to Mo Farah's 10,000m gold on Tuesday, started in sensational fashion on a rain-swept night, taking an early lead with his leap of 17.46. His second jump was a centimetre longer as he continued to lead the way. 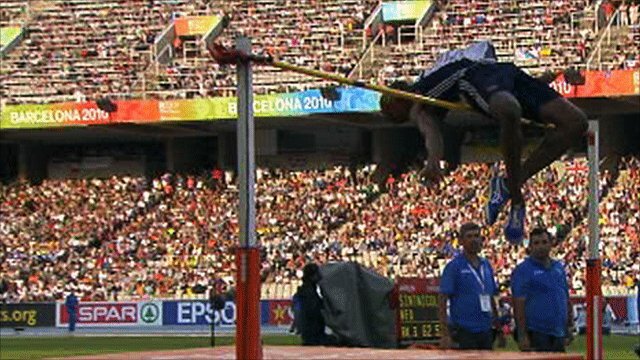 But it was his fourth leap where Idowu's dominance really showed, the world champion increasing his own personal best by eight centimetres with a huge jump of 17.81. That only served to increase the pressure on Frenchman Tamgho, who jumped 17.98 in New York in May but failed to live up to his favourite's billing, managing only 17.45 to take bronze behind Oprea, who finished second with 17.51. "I'm not satisfied with my performance at all, I was going for a win," said a disappointed Tamgho. "Physically I was here but not mentally." Briton Nathan Douglas finished a disappointing 10th with a best of 16.48 but Idowu, who opted not take his final jump with victory already assured, once again delivered on the big stage. "It's been a tough year, I don't know how but it just seemed to come," he added. "I knew I would have to do a big jump to win here ever since March [when Tamgho won the world indoor crown with 17.90] from the way Teddy was jumping. But me and my coach got it right and we planned for this day. "I suffered a few defeats earlier in the season and got a bit of stick. I had to be strong and it's come to pass." For Idowu, Thursday's victory saw him add to his Commonwealth and World gold medals, with the Briton now determined to complete the set of major titles at the London Olympics in 2012. Portugal's Nelson Evora denied him the Olympic title in Beijing in 2008 by five centimetres and Phillips has vowed not to miss out again. "There is one more medal in my career I need to win and that will come in a couple of years," he said. "I've worked hard for this. People think I'm a lucky athlete, but I'm not lucky, I've been doing this for 10 years now. I win gold medals. That's what I do. Hopefully now people will stop doubting me." Bernard, the 2006 Commonwealth silver medallist, passed at the opportunity to jump 2.19m, going straight to 2.23 and, after three attempts, he cleared the height. The 25-year-old went on to clear 2.29, his last successful jump of the night as Shustov went on to seal victory with 2.33. "I love being at the championships," said Bernard. "Last year I missed the World Championships in Berlin because I was injured and had an ankle operation. "This year I wasn't expecting to get here with my ankle, it was looking like a pin cushion at one point with all the acupuncture, so to come here and do OK is brilliant. "I wish I'd got 2.31m though. I think maybe at the training camp I had one ice cream too many, but it's a great thing to get a medal." But team-mate Tom Parsons was not smiling, however, the 26-year-old from Birmingham crashing out with three failures at the opening height. "It has to be to do with the conditions because there is no way I would not clear 2.19 in good conditions," Parsons said. "It's by far the worst conditions I have competed in, you could hear your feet squelching on the track. "I've probably not done enough practice in the rain this year, but I was too cautious with my first two attempts. I added more speed on the third and cleared the bar but just clipped it with my heel. I just did not deal with it well enough." Germany's Verena Sailer won gold in the women's 100m in a time of 11.10 seconds, ahead of French duo Veronique Mang and Myriam Soumare. Britain's Laura Turner failed to make the final, finishing a disappointing fifth in her semi-final in 11.41. Germany also took gold in the women's javelin, Linda Stahl throwing a personal best of 66.81m, with Olympic bronze medallist Christina Obergfoll taking silver and Olympic champion Barbora Spotakova of the Czech Republic bronze. The men's decathlon saw Frenchman Romain Barras edge to victory with a score of 8,453 points. Eelco Sintnicolaas of the Netherlands claimed the silver medal with 8,436 points while Andrei Krauchanka of Belarus took bronze with 8,370 points.